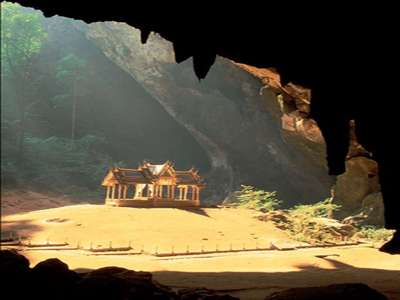 The Phraya Nakhon Cave was discovered by King Rama I. He discovered the cave while taking cover from a storm which he couldn't sail through. It is inside the Khao Sam Roi Yot National Park. Getting there is a challenge. First you have to rent a boat, then you have to walk up a steep track in the hill. Once there, however, you are met by a fantastic sight. The cave has two holes in the ceiling, which let sunlight and rain through, giving growing foundation for trees and vegetation.